This is the first stone I have kept from Ithaca. 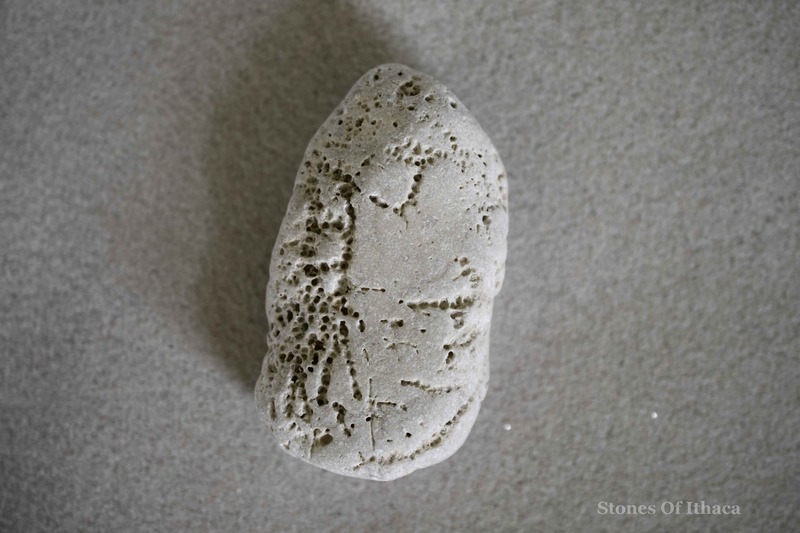 I found it on our first visit, on Polis Beach, where there is a cave in which was discovered a votive tablet to Odysseus, and which is also near to where Odysseus’ Palace is said to have been (very strategically) located. I was struck by this stone. It seemed to represent a link to the past, to a time when this legendary king may have walked along the very beach where I was, surveying the horizon, Cephalonia in the distance, the blue waters of the strait. The curious thing about this knob of land is that it is located on the west of the island, but looks east. It is the last piece of land one sees as one returns to the mainland, so I can quite understand why he would choose to place his Palace here, and also why he would choose Ithaca out of all the islands as his base. There is nowhere quite like it. See the helmet (or is it his hair? ), the outline of the eyelid, the nose with its nostril and mouth, the spattering of crosses (as on virtually every stone). This is my Odysseus stone. Meanwhile, in language, there are clusters of words, words that stick together. Let us take the example of “birth”. “Birth”, if we turn it around, gives us “third” (b-d), and indeed the normal outcome of a birth is to have a third person. It is also close to “breath” (we only need to open the vowels), and breath is the first thing a newborn infant must take when it is born. It is also very usual for a newborn creature to be “blind”, and we can see that these two words are also connected (phonetic pairs d-t and l-r, physical pair – pair that looks alike – h-n). So the two things we would normally associate with a birth are in the word: breath and blind. We might note that the reverse of “birth” gives “thrive” and “tribe” by the addition of a final e; also, “writhe”, and anyone who has witnessed a birth will see the relevance of this. But I would like to finish with a connection made by the phonetic pairs d-t and l-r and the alphabetical pair b-c: “birth” – “child”. “Child” is also in “Christ” (addition of s) – he became a child in order to show us the way.